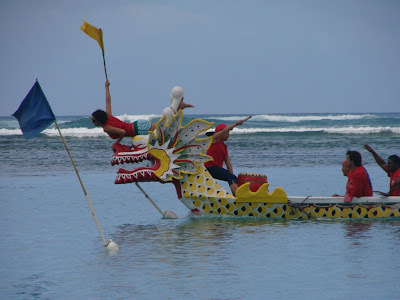 The yellow Dragon Boat team reaches for the flag and the victory in the Dragon Boat race at Ala Moana Beach Park. Before days of photo fnish cameras officials from referee boats would watch for the first time to full the flag to determine the winner of the race. It is all important since if you should pass and fail to grab the flag your victory would turn into instant defeat. 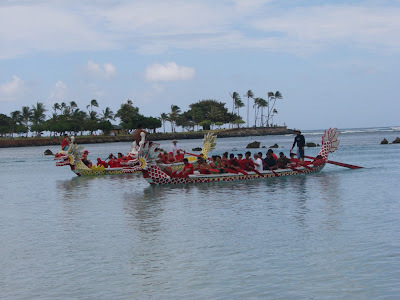 Two Dragon Boats race by Magic Island at the annual Dragon Boat Festival at Ala Moana Beach Park. These long and narrow canoe style boats originated in China over 2000 years ago and colorfully adorned with Chinese dragon heads and tails. The crew usually consists of about 20 paddlers, one drummer, one tiller and one person on the dragon head to grab the flag at the finish line. More tomorrow. Here is one of the rare pictures of me you will see in Hawaii Blog. 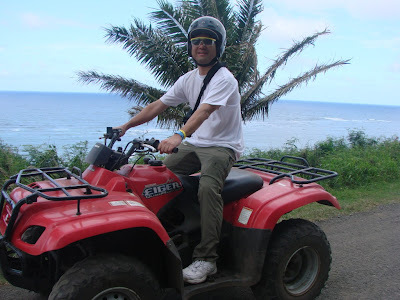 ATV riding is perhaps the most fun thing you can do at Kualoa Ranch as was the consensus of our group. You start slowly then as the ride goes on the speed picks up through rough terrain and narrower and narrower paths. I highly recommend this and also that you make it your last activity at the ranch. Also plan on getting very dusty (or muddy if the ground is wet). This concludes our look at some of the activities at the ranch. For more details see Kualoa Ranch.